In a previous column, I talked about ways to place and size pattern repeats for small projects like mittens and I’ve also talked about placement of larger patterns in garments. Now let’s tackle the question of smaller patterns in larger projects. 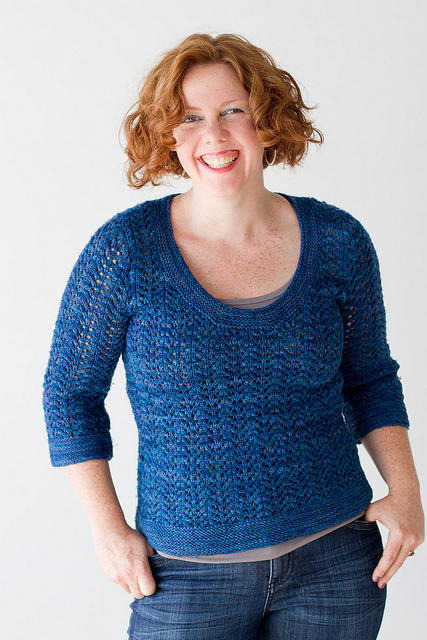 This sort of thing: Amy Herzog’s February Fitted Pullover (a free pattern on Ravelry). 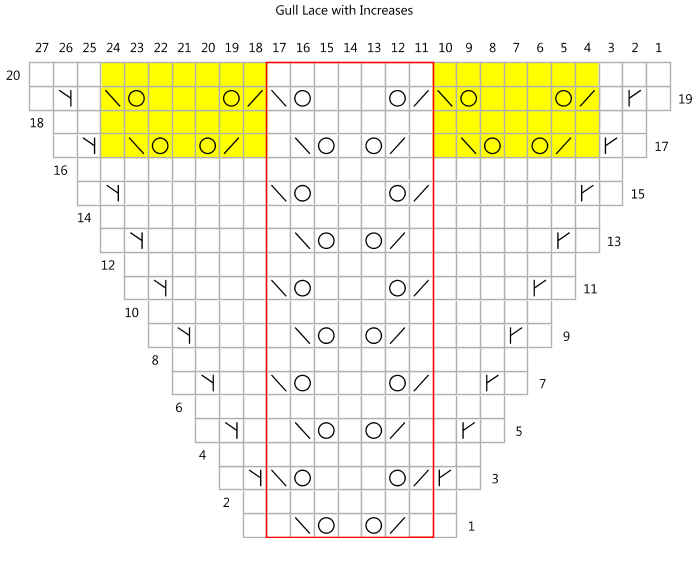 The Gull Lace pattern stitch used is a 7-stitch repeat, which permits a lot of different possibilities for sizing. If you’re working at the pattern gauge of 17 stitches per 10cm/4 inches, one pattern repeat is about 4cm/1.5 inches wide. This gives a pretty good scope for creating multiple sizes of a garment: in a multi-size pattern, there’s usually at least 5-8cm/2-3 inches between individual sizes, so you can comfortably create additional sizes by adding or taking away pattern repeats. A smaller repeat provides a fair bit of flexibility to create the sizes you want. As the repeats – and the gauge – get larger, grading can get more problematic. A 12-stitch repeat worked at 16 stitches/10cm means that each pattern repeat is 7.5cm/3 inches wide, and so you’re limited to sizes 7.5cm/3 inches apart. If the pattern repeat size and gauge mean that spacing between sizes is too big, you can consider adjusting the pattern repeat itself, as mentioned in the first column linked above. Or just create plain areas, as mentioned in the second. In this column, I’m going to focus on working with smaller repeats. When I’m creating a garment, I always start with the body circumference. When working with a small pattern repeat, I make that the stitches required are an even multiple of the pattern repeat. Easy! And as long as there’s no shaping, it’s all perfect. Which is to say that creating a garment body with no waist or bust shaping is likely the easiest design task you’ve ever taken on. But if you want sleeves, or a neckline, or waist or bust shaping, you’re going to need to consider how to handle the shaping. You can take some of the strategies discussed in the previous column, of course: add and work shaping in plain areas. If you’re adding a few stitches, in a relatively non-obtrusive place – 3 or 4 stitches at the sides, under the arms, for bust shaping – them working them plain in stocking stitch isn’t going to be all that noticeable. But when you come to something like sleeves, or even armhole or neckline shaping on the body, you’re likely to be increasing or decreasing significantly more than that. And, unlike the examples from the previous column, larger plain areas aren’t desirable, as they will detract from the design. For example: if it’s a full-length sleeve, you could well be adding about 12 cm/5 inches of width when you increase from the cuff to the top. That’s a lot of plain stitches, and it would significantly change the look of the sleeve. The good news is that because the repeat is small, that sort of extra width is more than enough to add in additional repeats of the pattern. The trick with this is to try to maximize the pattern area coverage, and minimize the plain areas. Let’s work through an example, a sleeve. A sleeve worked in this pattern will likely start with a multiple of 7 stitches for the pattern, plus 2 for the selvage. 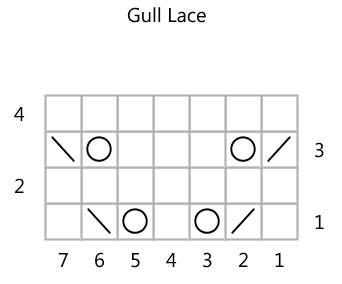 This was my first attempt to chart this out: I waited until I had a full seven stitches between the existing patterned area and the selvage, and I started up the pattern in the plain sections once I hit the first row of the Gull Lace pattern again. 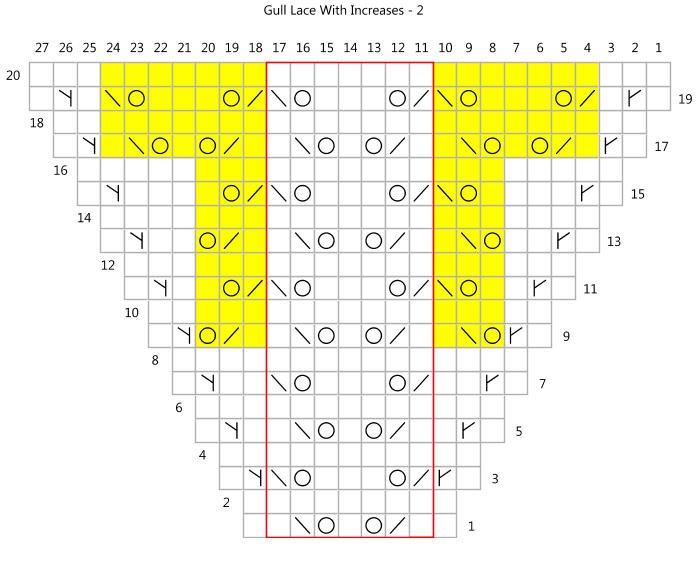 I’ve highlighted the new patterning in yellow. But as you can see there’s an awful lot of plain fabric in the shaping section before I introduce the pattern. 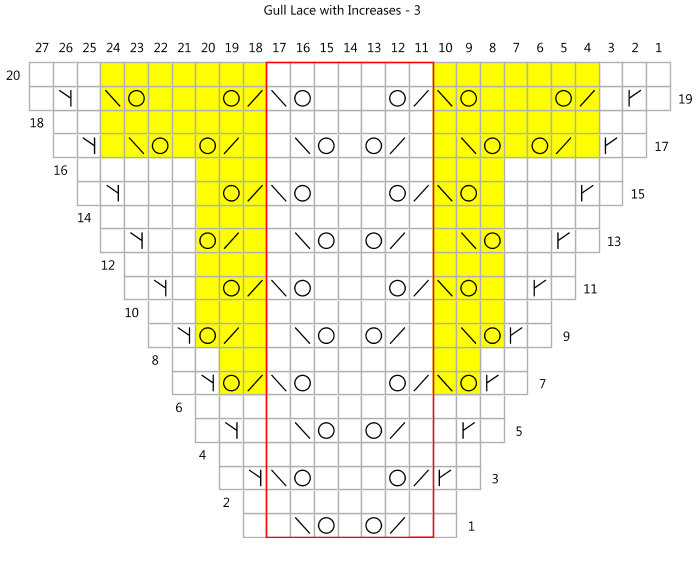 Remember that for lace, the pattern relies on yarnover/decrease pairs. And this opens up some wonderful possibilities! If you look at the pattern stitch, you’ll see that each RS row has two of these pairs, which means that each pattern repeat is easily divided into halves – stitches 1 to 3 include one of the yarnover-decrease pairs and stitches 5 to 7 include the other. This gives us an opportunity to add in partial repeats. In row 9 of the increases, there’s already 3 new stitches outside the patterned ahead, so we can add in half repeats. But there’s no reason at all to wait until you’re back at the first row of the Gull Lace pattern. If you look at the third row, you’ll see that you only actually need 2 stitches for the base lace motif, as it’s worked right at the start/end of the repeat, so you can start adding lace in on row 7 – corresponding to the third row of the Gull Lace. Even more lace and less plain! And there’s a further opportunity to get clever. Look at what’s going on in Rows 13 and 15 of the increases, in the chart above. There’s lots of stitches, at first blush it looks like there might enough to place the lace motif. 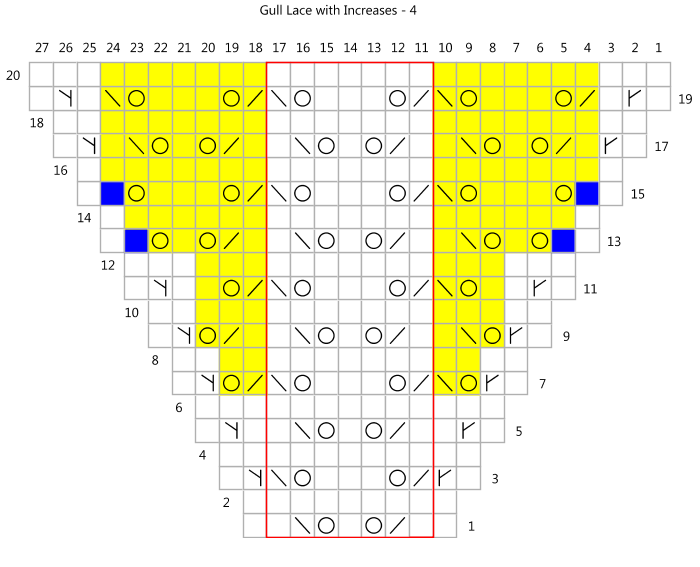 But if you count, you’ll see that the decrease would have to be placed in the same location as the shaping increase…. But this provides an excellent opportunity. In lace, when you work a yarnover, you need to work a decrease to keep the stitch count consistent. And for shaping, you need to add a stitch. So let the lace decrease and shaping increase cancel each other out, and just work the stitch beside the yarnover as a plain knit stitch. In the chart below, I’ve marked this stitch in blue. After all, the most visible part of a lace pattern is a yarnover, so you’re getting as much lace as possible! And you can employ similar strategies when decreasing, too. In this example, you’ve got partial repeats worked where space permits. And look at what’s going on in Row 19 – two overlapping decreases become double decreases. 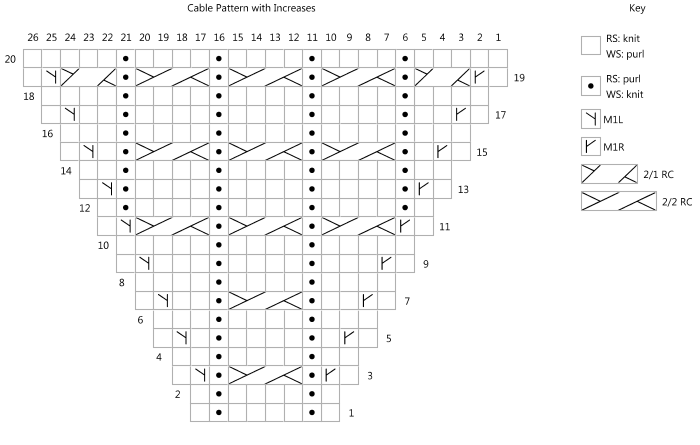 The key to these sorts of tricks is understanding the pattern stitches. 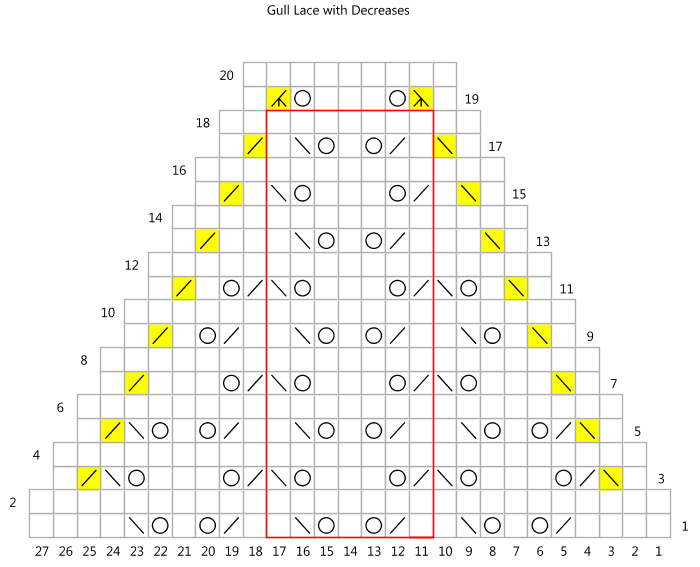 For lace, the elements are always a yarnover-decrease pair. When increasing or decreasing around a lace pattern, you have to have room to work both stitches in the pair, of course. But if an increase overlaps with a decrease, they cancel each other out. And if two decreases overlap, then just work a double decrease. The good news is that lace tends to be one of the more complicated styles in which to manage shaping, because you’ve got to allow for both stitches in the yarnover/decrease pair. For most other patterns, it’s much simpler, since you’re usually just thinking about a single stitch a time. Think about shaping in ribbing: even if it’s a (k2, p2) ribbing pattern, you don’t need both stitches of the rib to set the pattern. As before, the simplest solution is, of course, to wait until you’ve got the full number of stitches you need for the cable. But here, too, there’s a bit of room to get creative. If the cable used in the motif is 2 stitches crossed over 2, we could introduce a cable crossing 2 stitches over 1, to retain the overall look when you don’t *quite* have enough stitches. Remember, the usual goal with garment worked in an all-over pattern stitch is to maximize the pattern stitch, and clever little tricks like this work wonders. One of the reasons I love Stitchmastery so much is that it allows me to play with these possibilities, saving me significant swatching time and letting me be more creative.